Follow the N1 in a southernly direction. When you pass the town Richmond, stay on the N1 for about 64km where you will find the turn off to the R63 leading to Murraysburg on your left. Follow the R63 for about 42km and you will enter our town Murraysburg. Follow the N1 in a northerly direction. When you reach Three Sisters the road splits to the N12 and N1. Keep right on the N1 for about 41km where you will find the turn off to the R63 leading to Murraysburg on your right. 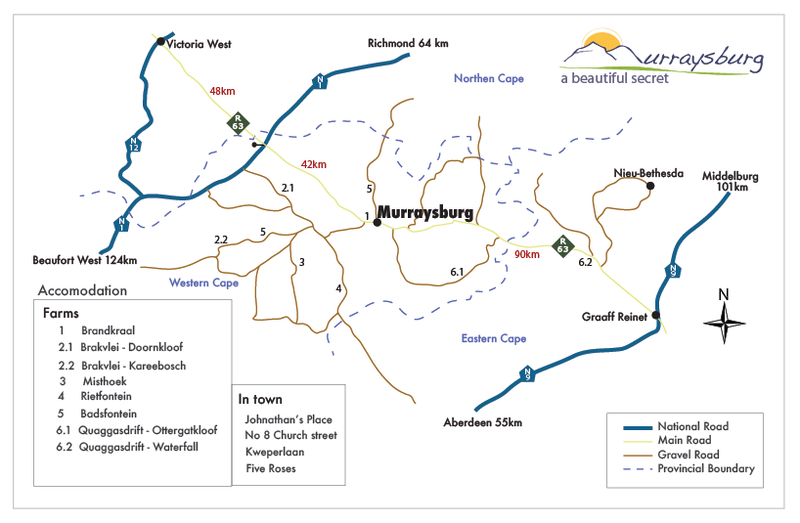 Follow the R63 for about 42km and you will enter our town Murraysburg. Follow the R75 past Uitenhage and through Jansenville to Graaff-Reinet and then on the R63 to Murraysburg.